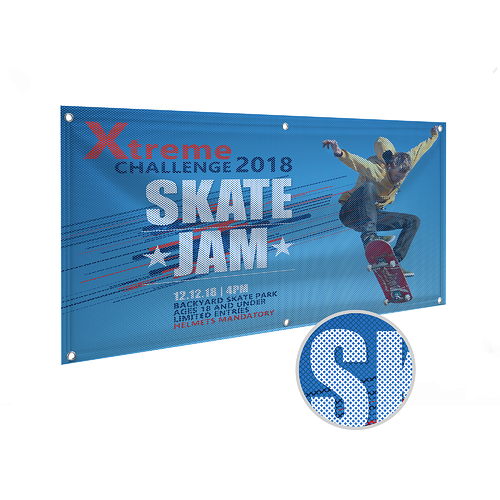 While we can guarantee you will be blown away by our mesh banner printing, we guarantee the opposite for our custom mesh banners. Mesh banners have small holes that allow wind to pass through, preventing your ad from flying off or tearing apart at the edges. The holes in the mesh banner material also allows some light to pass through, making this product ideal for placement outside windows. These banners are popular as outdoor signs, building wraps and construction fence banners. They can be used much like any other vinyl banner with the added benefit of more wind resistance. Print mesh banners on wind-resistant 9 oz. mesh vinyl in sizes as small as 3’ x 2’ or as large as 5’ x 10’. Ropes/cables/wires - Thread a thin rope or wire through the optional grommets to hang mesh banners to poles, trees, railings, ledges, and everywhere else you can secure a rope or a wire. Hooks - Use hooks to directly secure your banners through the grommets. Alternately, you can also use hooks as anchor points for ropes, which is handy if you want to hang your banners from a ceiling or in a spot that’s impractical to tie a rope to. Nails/pins - In a pinch, you can use nails or push pins to hold a banner in place through the grommets. This can be practical for hanging banners for short periods. As with hooks, you can also use nails as anchor points for ropes or wires. We can also add hemming to your custom mesh banners for a neater, more professional look. Order printed mesh banners now and have them ready as soon as 2 days.